Perfectly shaped eyebrows can make your eyes look larger and give your face a clean, polished look. With perfect eyebrows you can not only look younger but you can also change the shape of your face. Eyebrow shapes are always changing with fashion, from very full to thin brows and straight to a high arch. However, a professional beautician does shaping your eyebrows beyond basic grooming. Although, once you get the line and shape you want, you may be able to maintain it with regular tweezing yourself. 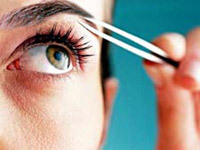 Tweezing your eyebrows is the most dramatic way to change your face without too much pain and discomfort. Following are a few tips that will help you shape your eyebrows. Numb your eyebrows with ice and keep the ice near by. This will help you feel less pain. Sit near a window to get the best light. Natural daylight is the best bet, so sit near a window and use a hand-held magnifying mirror. Cleanse the brow area thoroughly. Using a brow pencil, outline the brow`s natural line. This acts as a guide and prevents you from plucking too much hair. 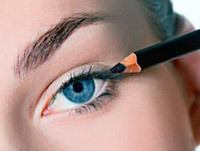 Gently pull the skin of the outer edge of your eyebrow up and out so that you can see the brow bone. Use a pair of tweezers to pluck the hairs. Pluck out one hair at a time, tweezing in the direction the hair grows. When you begin tweezing, start at the middle of the brow and work towards your ear, and then work from the middle in towards your nose. Start plucking in the middle of the eyebrow and pluck toward the outer end; then go back to the middle and pluck toward the nose. Your brows should extend a little beyond each corner of your eye. While tweezing the area underneath the brow, follow the natural shape and avoid plucking hairs from above the brow. Don`t pluck too much from either end - brows should extend a little beyond the corner of your eyes. When shaping your eyebrows use your facial features as a guideline. After you finish tweezing your brows, wipe the area with a cotton bud or swab dipped in some antiseptic lotion to avoid any infection. Rub a piece of ice on the area if it feels sore. If your eyes are puffy, avoid dark eyeliners, which draw attention to under-eye bags. You can curl your eyelashes by using a metal or plastic lash curler. Make sure to catch all the lashes at the same time in the mouth of the curler and curl them upwards. Hold curler closed against lashes for at least 5 seconds to set curl and then open the scissor ends gently to release the curler. Use eyeliner along the upper lash lines only; since this helps to open up the eyes. Enhance the curl you`ve just achieved by applying mascara right after curling. For more curl or to refresh curl later in the day, stroke the brush to the tips of lashes and hold there for 3-5 seconds, at an upward angle. Go easy on the concealer since if it is smeared too much on the puffy tissue it is a total beauty disaster. Moisturize beneath the eye area to ensure the concealer glides on smoothly. Experiment with bright white or icy silver shades on your eyelids to give the illusion of lift. Apply cosmetics between the inner eye and nose for instant lightness.